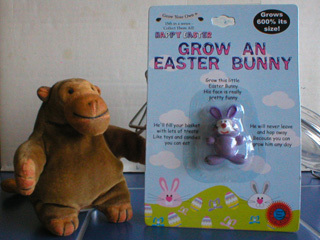 On the way home from a meeting in London, Miss Carol bought a small package which promised Mr Monkey the opportunity to grow an Easter Bunny. 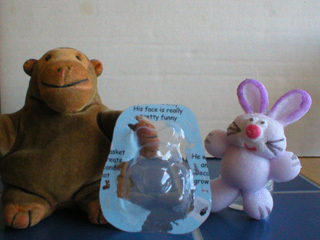 Mr Monkey inspected the packaging of the Easter Bunny, to see what the instructions were, and how likely it was that the resultant grown bunny would be overly large. Once he'd decided that "Grows 600% its size" didn't mean that the fully grown rabbit would be six times as high and six times as wide as it had started, and that growing it simply involved leaving in water for three days, he decided it was a safe enough project. 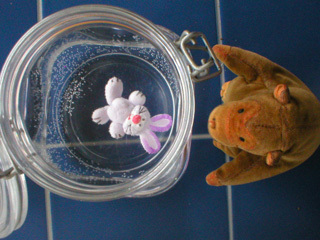 He arranged for Mr Rik to fill a jar with water then, in a caring manner, pushed the tiny rabbit into the water. 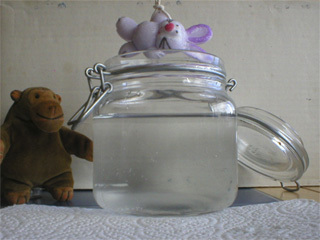 The rabbit plunged to the bottom of jar, and just lay there. 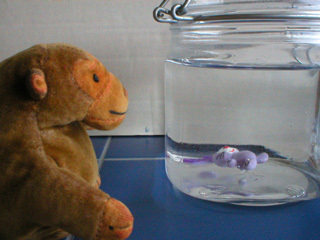 Mr Monkey hadn't expected anything to happen immediately, so he went off and did something more interesting. Every so often he popped back to see his rabbit attain mammoth proportions. Or not. 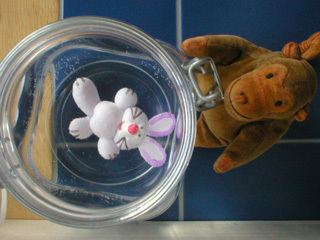 The packaging claimed that the rabbit would start to grow after an hour, but even after almost 5 hours Mr Monkey couldn't really spot any growth to speak of. 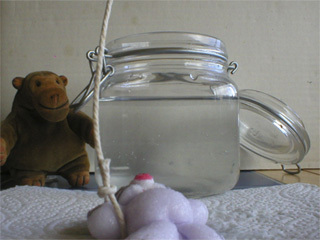 There were quite a lot of little bubbles on the inside of the jar, though. 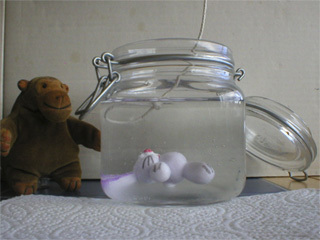 After 24½ hours of being in the water, the rabbit had started to expand noticably. 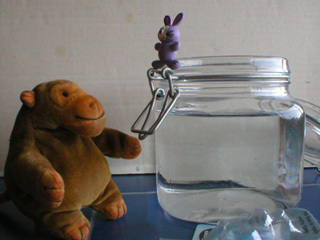 Mr Monkey didn't think he should interrupt the experiment (or get his paws wet) by taking the rabbit out of the water to measure it, so the exact increase in size was uncertain. 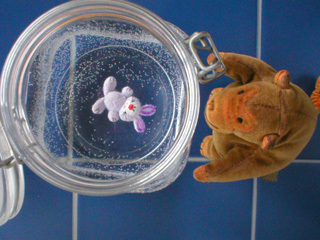 The expansion of the rabbit was even more noticable when Mr Monkey peered at the damp beast through the side of the jar, but that was just due to refraction. When Mr Monkey checked the rabbit after 34¾ hours he noticed that its right leg seemed to be expanding more than the rest of the rabbit. After 51¾ hours, the disproportionate size of the rabbit's right leg was even more pronounced, and Mr Monkey began to worry that he was growing a lop-sided rabbit. The instructions claimed that the rabbit would be fully grown in 3 days. 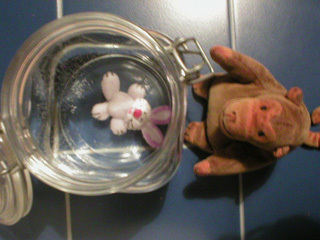 72¼ hours after the bunny walked the plank, Mr Monkey decided that the rabbit had probably got as big as it was going to get, and started to wonder how he'd get it out of the water. 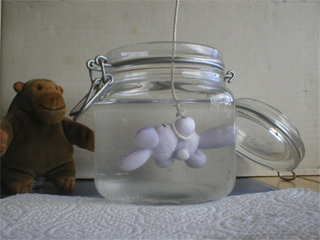 A couple of hours later, Mr Monkey acted as overseer as Mr Rik used a string lassoo to snare the bunny and whisk it out of the water and onto a convenient paper towel. 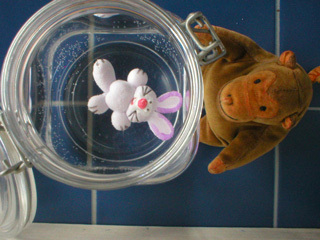 Mr Monkey was careful to avoid drips of dangerous water as the bunny swung in the air. 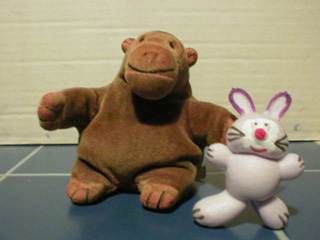 Mr Monkey studied his expanded Easter bunny. 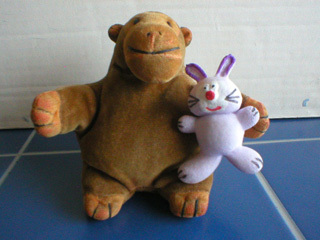 Its skin was strangely slippery to the touch, so Mr Monkey avoided touching it too much. He compared the big rabbit with the small plastic blister pack it came in and thought that, taking into account that it had grown in three directions, the rabbit probably had grown 600% or so. 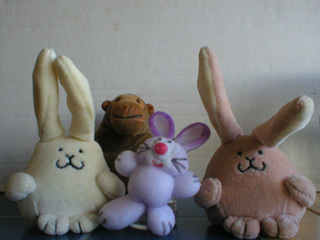 Mr Monkey's other rabbits, Mr Bunny and Mr Bunny, came along to inspect the new rabbit. 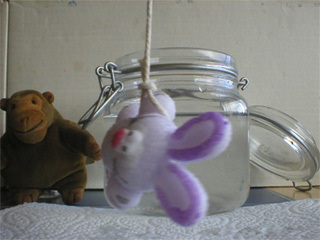 The Easter Bunny started shrinking very soon after being taken out of the water. After 30½ hours in the open air, the bunny wasn't slippery any more and its ears had started shrinking. 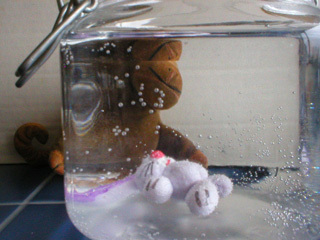 48¼ hours after the bunny was left out to dry, its ears were almost as small as they originally were. The bunny still had a giant right leg, though. When the rabbit had been standing around shrinking for 81½ hours Mr Monkey decided it had shrunk back to its original size, except for its right leg. 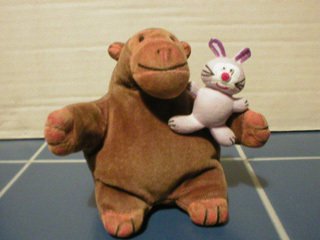 The rabbit's skin had changed a little, and Mr Monkey wondered if being inflated and deflated was really good for it.